Porsche has announced that a 440PS GTS version of its Cayenne will be available to order from November 19, priced from £72,523. Power comes from a twin-turbo V6 petrol engine and is up 20PS over the old car’s V8, to 440PS. Torque is up too, by 85Nm to 600Nm. Performance is impressive – 0-62mph takes a sports car rivalling 5.1 seconds with the optional chrono pack installed, while top speed is 162mph. Externally the Cayenne gets the front styling from the Cayenne Turbo, plus the Sport Design package, which includes wheel arch extensions. There is also a roof spoiler, plus black contrasting details including the lettering and 20-inch alloy wheels. In the cabin there are eight-way electrically adjustable seats trimmed in leather and Alcantara, with various other Alcantara interior upholstery elements. Porsche has also added a new entry-level Cayenne model, powered by a 3.0-litre naturally aspirated V6 linked to an eight-speed automatic transmission. Peak power is 300PS, giving a 0-62mph sprint time of 7.7 seconds and a top speed of 143mph. 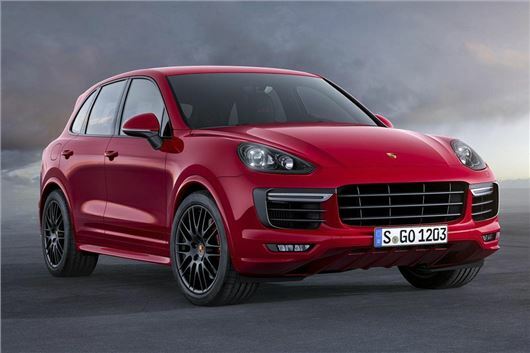 The entry level Cayenne is priced from £49,576.